1. “Sam” as in Jeff’s brother’s first name. “Ard” as in the last three letters of “yard,” since he set an all-time record for reception yards playing football at Notre Dame. “Zija” as in the name of some weird “miracle tea” that the Internet says is a marketing scam and that one Amazon reviewer says gave her diarrhea. 2. “Samar” as in a province in the Philippines whose capital is Catbalogan City. “DZI” as in the three-letter code for Codazzi Airport in Colombia, so small there does not even appear to be a Cinnabon. “Ja” as in the unit of measurement of length in Korea equal to approximately 30.3 cm. 3. “SA” as in Sexaholics Anonymous. “Mardz” as in a woman in Macedonia renting out her apartment on Airbnb. (Just $46/night!) “IJA” as in the International Jugglers Association. 4. “Sama” as in the Society of American Mosaic Artists. “RD” as in Rainbow Dash, a character in the TV Show “My Little Pony: Friendship is Magic.” “Zij” as in the Islamic astronomical books. “A” as in America, where Samardzija was born. 5. “S” as in “starting pitcher.” “Amardzija” as in the last 9 letters of Jeff Samardzija’s name. Now you will never forget how to spell Samardzija. Or maybe you will. Sorry. 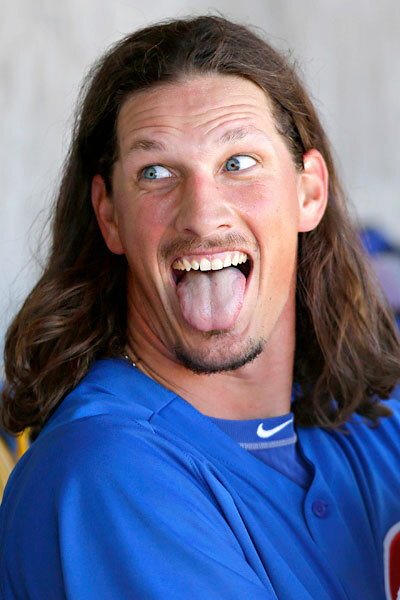 We hoped you liked reading Jeff Samardzija Mnemonics by Jeremy Blachman! That’s some nasty gum recession Samardzija’s showing on his upper left central. Midl recession and discolouration on the left top incisor as well. This should have a watch for the near future.